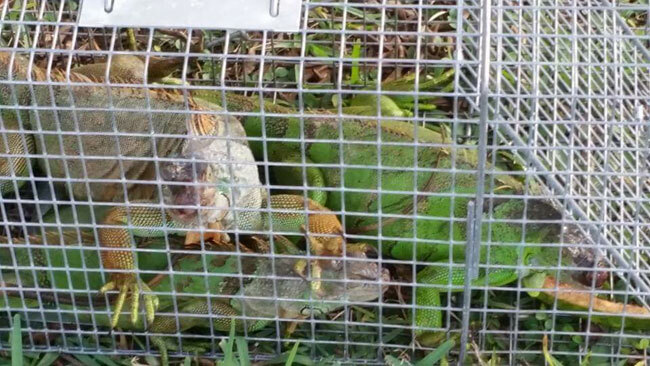 We specialize in removing nuisance iguanas. Iguanas are a non-native species of reptile living here in South Florida. These lizards vary from green, brown and yellowish – orange in color. Iguanas are native to Southern Mexico, Central America, South America and Caribbean Islands. Florida has the perfect terrain and climate for them to live. The common problem with them is that they love to use the decks of pools, sea walls, and sometimes the roof of houses as a latrine. This naturally causes an odor and can lead to health problems for humans and their pets. Iguanas also love to eat plants and flowers around your house or in the garden. Replacing your landscaping on a regular basis can get expensive! These reptiles can be dangerous if encountered by humans or pets. They have sharp claws and long tails that they use to whip their predators with. Their bite can be strong and can cause damage if bitten. Do you have an igauna emergency?